“The U.S. government puts the finger on the United Nations’ enemies,” said the posters for this first short film (56 minutes) in the Why We Fight series. 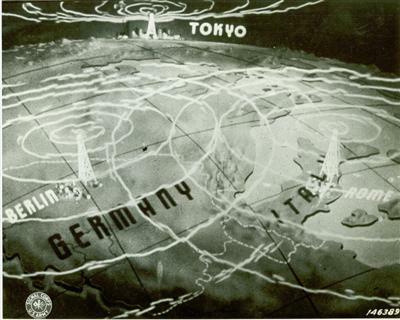 The great populist Frank Capra, acting under the orders of General George C. Marshall, used newsreel footage, recreations, and a sometimes melodramatic narration (voiced by Walter Huston) to sell Americans on the idea of taking on the axis of Germany, Japan and fascist Italy. Actually, the films were designed to educate enlisted American soldiers about why they’d be risking their lives, but FDR decided that the shorts should be made available to the American public as well, to sway popular opinion away from the isolationist sentiment that had taken hold after World War I.
Prelude to War, the first of seven Why We Fight films, explains why America is founded on the principles of freedom (Mohammed and the Koran are included with Christ and Confucius, a useful reminder for Arab-bashers), while the Enemy relies on brute force, mob mentality, and corruption. It’s all propagandistic as hell, of course — try to find any WWII-era American pop-cultural artifact that isn’t — but Capra was among the best at it, and, surprisingly, the people of the enemy nations are not dehumanized, but presented as misguided masses who put their trust in the wrong madmen. Stirring even to a knee-jerk pacifist like me, this made me wonder why later wars haven’t had a Capra to convince the public of the conflict’s moral rightness.